Its ruler re-named the days of the week after himself and his mother. Opera, ballet and the circus are banned. To get a driving licence, citizens must sit an exam on the dead leader’s autobiography. Welcome to Turkmenistan. Landing in Ashgabat, there's no sign telling you where you are. No «Welcome to Ashgabat», no «Ashgabat International Airport, Terminal One» or anything of the sort. Instead, atop the terminal building, there is simply an embossed shiny head; the profile of a middle-aged man in gold. Turkmenistan has done its best to keep out journalists for the past decade, and has long been an unattainable dream for Moscow correspondents like myself. But due, it seemed, to some kind of administrative error, they had let a few of us in, ostensibly to cover a tedious-sounding Investment Forum, and here I was stepping off the plane into one of the world's most isolated and bizarre countries. The gold head was the first sighting of a man that would follow me around for the whole time I spent in Ashgabat. He was Saparmurat Niyazov, the local Communist party boss who had taken over as president when the country gained independence from the Soviet Union in the early 1990s, and created a personality cult unrivalled anywhere else in the world, except perhaps for North Korea. He decided he wasn't going to be boring old Mr Niyazov, he would be Turkmenbashi – Leader of all the Turkmens. He was Saparmurat Turkmenbashi the Great; he was the All-powerful and Fearless Serdar; he was the Eternal Sun of Turkmenistan and the Great Architect of the Golden Age of the Turkmens; he was the Father, the Prophet, and the President for Life. Since December 2006, he was also dead. But nevertheless, he was very much still here. A scruffy, miserably inhospitable patch of desert with nothing much going for it, Turkmenistan is watched closely by the rest of the world due to the vast reserves of gas – the fourth largest in the world – that lie under its arid sands and off its Caspian coast. With the cash that flooded into the country as the gas flowed out, Turkmenbashi built possibly the oddest city in the world. Ashgabat is not simply bizarre. It's world-class nuts; Olympic-Gold-level bananas; truly and utterly bonkers. For years it provided pithy news stories written from Moscow or London (it was rare for anyone to gain access to check for themselves). Turkmenbashi renamed the days of the week and the months of the year after himself and his mother. He banned opera, ballet and the circus, but opened a giant theme park based on Turkmen fairy tales. He made his book, the Ruhnama, compulsory reading for all schoolchildren, and everyone needs to sit an exam on it to get a driving licence. On a first walkabout, the city more than lived up to its bizarro billing. Turkmens are an eye-catching bunch, especially the women. They wear ankle-length dresses made of silk or velvet, which come in a whole host of bright purples, oranges, blues and greens; the necks adorned with intricate gold-thread embroidery that comes down in a sweeping column from the throat to the navel. Any gathering of Turkmens turns even the most mundane setting into a kaleidoscopic whirl of colour and excitement. But none of them were here. Nobody. Over in the old part of town, the bit they don't want foreigners to see, locals live in a normal, shabby Soviet city, many neighbourhoods of which were simply bulldozed down to make way for the new city. This ever-expanding new section consists solely of huge white marble buildings, set along broad avenues completely bereft of people, save the armies of cleaners who keep them so spotless you could eat your dinner off them. As few people can afford the new apartments, most of them are empty. I felt as though I was an extra in an apocalyptic disaster movie, walking along these long, wide avenues framed with shimmering new buildings but with hardly a soul in sight. Here in the very heart of Central Asia, that romantic region of teeming bazaars, mysterious alleyways and ancient mosques, is a brand-new city full of sterile white-marble high-rises and glimmering gold statues of the man who ordered them built. At its centre is (of course) Turkmenbashi Square. On three sides are vast palaces; the too-new shine of their white marble facades marking them as recent creations. On the fourth and final side of the square is the city's crowning glory. Three wide white legs stretch down dozens of metres, straddling a roundabout; a giant tripod base on which is mounted a white, somewhat phallic structure in the shape of a space shuttle. And atop this, high in the air, a statue all in gold, of a middle-aged man with his arms outstretched above his head in a pose of religious ecstasy, like a maniacal preacher. Yes, it's Turkmenbashi, rotating throughout the day to always face the sun. To make things more complicated, the country is now afflicted with a bipolar personality cult. When Turkmenbashi died in 2006, his former dentist, and then Minister of Health, the tough-to-pronounce Gurbanguly Berdymukhammedov, took over as the new leader. While the golden statues of Turkmenbashi remain, the more transient elements of his personality cult – portraits on buildings, banknotes, and so on – have been slowly removed, and Berdymukhammedov has instigated his own, creeping personality cult. Younger than his predecessor, Berdymukhammedov's jet-black hair is swept back over a pudgy face in the same way as the great Turkmenbashi, but with a more sinister effect – he looks like a slightly vampiric librarian in the giant posters that adorn almost every building in the city. When he came to power, there was much talk of liberalisation, but in Turkmenistan, everything is relative. Previously, nobody except a select few government officials was allowed to use the internet. Now, there are four internet cafes in Ashgabat, but there are only five computers in each, the connection is medievally slow, and surfers have a double reminder that Big Brother is watching – not only does a portrait of Berdymukhammedov stare down from the walls, but in the one I visited an officious young man with slicked back hair took note of everyone's name and passport number before they were allowed online. Berdymukhammedov has also carried on Turkmenbashi's penchant for vanity mega-projects. His big idea is the construction of one of the world's best tourist resorts at a cost of billions of dollars at Avaza on the Caspian Sea. No matter that the water is too cold to swim in most of the year, the beach is covered in sea snakes, and it's almost impossible for anyone to get a visa and visit the new paradise. The order was given to build a giant resort, so a giant resort is being built. Nobody questions the president. The television news follows his every move, and he's followed everywhere by hordes of clapping, grinning schoolchildren. Recent televised stunts have included driving across the desert country in a race against two professional racing drivers (no prizes for guessing who won), and the inauguration of a new cancer centre. Berdymukhammedov, a dentist by training, performed complex surgery to remove a tumour from a patient, although informed sources told me that he simply wielded a scalpel and grinned for the cameras, while the real work was done by two German surgeons who had been specially flown in. The Turkmen officials at the forum spoke in a tedious monotone, droning imaginary statistics and making obligatory references to the «marvellous initiatives of respected president» roughly every 30 seconds. I cornered the deputy health minister at the end of one session to ask if the country had a problem with HIV. She shot me a look of worried suspicion, and said: «We are building a big new HIV prevention clinic. But luckily so far we don't have a single case.» This in a country that borders Afghanistan and its heroin supplies, where prostitution is widespread, and where all the other countries in the region admit to a serious HIV problem. She later suggested it would «perhaps be better if you didn't write an article about this». Not that this seemed an issue for companies looking to invest in the country. Speech after speech of praise from Western companies drew smug smiles and nods of approval from the Turkmen officials listening through their translation headsets. The parade of foreigners telling them in obsequious language how wise and talented their president is was reminiscent of emissaries sent to the courts of ancient Khans to win trading concessions with gifts and beautiful words, and hardly seemed like the best way to drag the country out of its self-imposed isolation. «Zis Prezident it trruly an innovator,» chirped one overexcited German from the podium, urging delegates to invest in the gold-plated haven of Turkmenistan. A Brit, representing the EBRD, spoke of the country's wise political course. Nobody deemed it fit to remark that we were in one of the weirdest and most autocratic countries in the world. And of course, few of the companies actually wanted to make-long term investments in such an opaque country. «Most people here are vendors, not investors,» one delegate confessed quietly on the sidelines of the forum. They're happy to build any palace or five-star hotel that the Turkmens ask them to. But actually invest long-term and expose their money to risk? Not a chance. I escaped from the conference and got chatting to a group of young Turkmens sitting in a café. They were well dressed and tapping on i-Phones, and it transpired they all worked in international companies in Ashgabat – they were some of the lucky few who had been allowed to study abroad for a year, and had picked up English in the US. «I learnt more in six months in the US than I did for four years at the best faculty of the best university in Turkmenistan, where I learned absolutely nothing,» one of them told me. While there might not be brutality on as widespread a scale as in neighbouring Uzbekistan, this is only because Turkmens on the whole appear to have accepted their lot, and know not to talk out of turn. This is partly due to the most spectacular dumbing down of society. No books are printed except the Ruhnama – Turkmenbashi's turgid ramblings on life, morals and Turkmen history – and Berdymukhammedov's tomes. Despite being in office less than three years, he's already managed to knock out a book on cooking, one on horses and one on herbal medicine, and the TV news features nothing but Berdymukhammedov and dancing children. To test out just how isolated the place really was, I played a game on a Friday night out at one of Ashgabat's few nightclubs. I asked 10 different people, all young well-to-do types in their twenties, if they could name the current US President. Seven of them expressed total bemusement, one guessed «Bush», and one of the bartenders disappeared to phone a «friend who knows everything», and returned a few minutes later proudly brandishing a piece of paper on which was written in neat Cyrillic letters, «Vagassa Avama». Only one, a shy young ethnic Russian girl, guessed Obama, but then collapsed in a fit of giggles and said she was sure she must be wrong. While the personality cults of both Berdymukhammedov and Turkmenbashi were on display at every street corner, it was only when I arrived in Gipjak, the village about 15 miles outside Ashgabat where Saparmurat Niyazov had been born in 1940, that the utterly outrageous extravagance of his cult really became clear. This was where the Turkmenbashi Mosque had been built. The shiny white marble and vast gold dome meant that, like all the new buildings in Turkmenistan, it was somewhat tacky, resembling what Hotel Mecca, Las Vegas, might look like if such a thing was ever built. But while it could hardly compete with the great mosques of Iran and the Middle East for elegance, its sheer size meant it was hard not to be impressed. Approaching the mosque from the road, I walked past over a hundred fountains bursting from lush green grass by the roadside, before entering a walkway surrounded on both sides by fountains and green Turkmen flags. The mosque itself was on a platform about four metres above the earth, and water cascaded down all the sides. The four soaring minarets were of white marble ringed with gold bands, and the mosque itself encased by a grand wall with marble columns and eight porticos. Under the main gate of the mosque was not a quote from the Koran, but a long quote from the Ruhnama and the words «Turkmenbashi is Great». 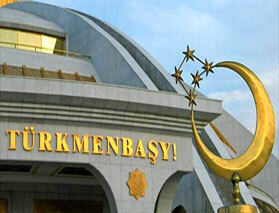 Inside, around the base of the dome, blue-lettered slogans extolled both Allah and Saparmurat Turkmenbashi the Great. This was perhaps the crudest attempt to fuse the personality of a dictator with that of God in modern times. Turkmenbashi had got billions of dollars of Saudi aid after completing the hajj in the Nineties, and had promptly built a mosque with his own name scrawled all over it. Visible behind the mosque were the hazy Kopet Dag mountains, and behind them, Iran, just a couple of dozen miles away. I imagined that the penalties in Iran for writing one's own name inside a mosque were not pretty. Even the pictures of Ayatollahs Khomeini and Khameini, the leader of the Islamic Revolution and his successor, which are everywhere in Iran, are never to be found blasphemously adorning the outside or inside of a mosque, still less would their names be allowed to be inscribed on a mosque interior. I felt a bit sorry for Salman Rushdie and the Danish artist who drew the infamous Mohamed cartoons – surely Turkmenbashi, when he was still alive, was a far better candidate for a fatwa. A guard told me the mosque could seat 20,000 worshippers, but when I returned for Friday prayers, 100 were there at most. The Turkmenbashi Mosque was only one of thousands of monuments that the odious man had dedicated to himself, but it stood out as perhaps the biggest and most obnoxious squandering of money of all. It had some fairly stiff competition though. Back in Ashgabat, I took myself off one afternoon to a new museum and library complex that had been built just before Turkmenbashi's death. Another Vegas-style extravaganza, this featured three marble buildings with golden domes facing onto a courtyard, each with four enormous stone lions roaring from pedestals at the front. The streets around it were completely deserted, but as I approached the entrance, I saw two Turkmen guys get out of a car and walk up to the complex, taking pictures of the building on their mobile phones. I went over to say hello to them, and they expressed expletives of amazement at the fact that I was from England. We spoke in Russian, which most Turkmens speak along with their native, Turkic tongue, in a legacy of the Soviet period. Murat and Ali turned out to be oil specialists from one of the regional capitals, in town visiting family. It was the first time they had been to Ashgabat for four years and they had all the marks of the wide-eyed provincial in the big city as they looked in awe at the imposing buildings around them. Ali was quiet and affable, while Murat wouldn't stop talking and had a rather unpleasant hectoring tone. He also turned out to be the first real Turkmenbashi enthusiast I'd come across. The first floor of the cavernous museum was devoted to gifts that had been given to Turkmenbashi – malachite vases, elaborate timepieces of solid gold, crystal dining sets, enormous carpets. Murat would call me over every now and then to bellow about a particularly lavish gift, peppering his speech with the Russian expletive pizdets, a vulgar expression of surprise derived from the word for the female genitalia. Who exactly the «they» was for the most part remained a mystery. Most of the exhibits had a label explaining what it was but not designating the giver, which led me to wonder whether he hadn't given most of them to himself. Especially suspicious were several carpets woven with verses from the Ruhnama and the Turkmen national anthem (first line: «Turkmenbashi made Turkmenistan great»). Afterwards I went for a beer with Ali and Murat. The talk moved to the inevitable subject of money. They asked me how much was the lowest that a skilled worker could expect to be paid per month in England. I said about £1,000, to keep it on the low side, and reminded them that they had to remember that taxes were higher in England and so were prices. They looked at each other in amazement. Then they asked how much rent I paid per month for my apartment in Moscow. I halved the amount and they were still gobsmacked. They told me that they earned about £100 per month. This for the employees of a state oil company with higher education and 15 years of specialist experience. Even though utilities were free and prices in general were low in Turkmenistan, it was still a shockingly low amount of money. Ali spent his weekends working as a carpenter to make ends meet. It was unclear whether these rewards would come in a few years, or in the afterlife, but it was fairly obvious they weren't here yet. I didn't think it was worth probing this logical crevice any further. Not for the only time in Turkmenistan, I was left wondering if someone had been fully taken in by the years of propaganda they'd been subjected to, or if they were well aware how messed up the situation was but were trying to persuade me – or themselves – that Turkmenbashi really had been a wise and just leader. I'm at the departure lounge of the airport, waiting for my less-than-convenient 4.50am flight back to Istanbul. Two of the handful of destinations that Turkmenistan Airlines flies to turned out to be Birmingham and Amritsar, and the small, shabby departure area was crammed with around 200 exhausted Sikhs with Midlands accents waiting for their connecting flight. It's almost impossible to book tickets on Turkmenistan Airlines – they have no website and aren't bookable at online sites like Expedia. But a few Birmingham travel agents had apparently got hold of tickets and were selling the Birmingham-Amritsar via Ashgabat route at knock-down prices. I asked a few of them if they'd ever heard of Turkmenbashi or knew anything about the country. «To be honest I'd never even heard of it until we got the tickets. I've got no idea where we are. Are we somewhere near Russia?» one of them asked me in a heavy Birmingham accent. I started telling them about Turkmenbashi, the Ruhnama, the statues, and so on, but they didn't seem to believe me. Giving an impromptu 4am lecture on Turkmenbashi's political thought to a group of Brummies in turbans was not how I expected to end my time in Turkmenistan. But on balance, it was an appropriately surreal way to end my stay in the world's most bizarre country. * Turkmenistan occupies 188,456 square miles, an area slightly larger than California. * Major languages are Turkmen (spoken by 79 per cent of the population) and Russian (12 per cent). Nine per cent speak Uzbek. * Religion: 89 per cent are Muslim. * Main exports are oil, gas, textiles and raw cotton. * Life expectancy for men is 59 years, 68 for women. * Infant mortality rate is 45.36 deaths per 1,000 live births. * Annexed by Russia between 1865 and 1885, the country became a Soviet republic in 1924, called the Turkmen Soviet Socialist Republic. * Gained independence from the Soviet Union in 1991. * Large reserves of natural gas, produce roughly 70 billion cubic metres each year, but it has suffered from a lack of adequate export routes. The economy remains undeveloped and much of the population still lives in poverty. * The average wage is £120 to £220 a month. * The gross domestic product for 2008 was estimated at $30.332 billion. * Currency is the Manat, which subdivides into 100 Tennesi. Previous president Saparmurat Niyazov appears on the 500 manat (£107) note, currently the highest denomination. * Although official figures place unemployment at five per cent, international organisations estimate it is closer to 50 per cent.